Those of you who are familiar with my review of the German Physiks Unlimited II, the HRS-130’s little brother, may recall my esteem for Lincoln Walsh’s revolutionary bending-wave transducer, developed in the early 1960s and later adapted by German Physiks. Superficially resembling an inverted ice cream cone, Walsh’s coherent-sound loudspeaker was a serious attempt to mimic the soundfield produced by a small cylinder pulsating radially with every portion of its area moving in and out simultaneously and in phase with the input signal. This, according to Walsh, is coherent sound. It should be intuitively obvious that such a design is capable of wide-range operation and by its nature generates an omnidirectional radiation pattern in the horizontal plane. There are many twin-cone wide-range drivers out there but none of them can match the phase fidelity of the Walsh transducer because of the conventional drivers’ severe breakup modes in the upper midrange. In contrast, a bending-wave transducer exploits the non-rigidity of the diaphragm material, working with it rather than fighting it. In the late 1970s Peter Dicks picked up Walsh’s mantle with the express goal of improving on the original aluminum-sheet-based approach. His titanium-based prototypes eventually caught the attention of German Physiks’ Holger Mueller who went on to commercialize the Dicks Dipole Driver (DDD). German Physiks has been manufacturing DDD-based designs since 1993 and has continued to evolve the technology in excursion capability, power handling, and enhanced bandwidth to beyond 24kHz. A carbon-fiber DDD became available in 2006 alongside the classic but fragile titanium type. Much more robust physically and capable of being driven harder, the carbon-fiber DDD represents a considerably more practical engineering solution. Because the DDD is optimized in dimensions and cone profile it does not have to be supersized to increase efficiency. Hence, the same driver is used in all models regardless of cost, while several drivers are used in parallel in some of the upper-end models in order to increase overall sensitivity. The HRS-130 deploys one carbon-fiber DDD and a 10-inch floor-loaded woofer (rather than the 8-inch of the Unlimited Mk II). The enclosure is also bigger than that of the Unlimited and uses a sophisticated octagonal cabinet construction in order to reduce colorations and to smooth the bass output. Specifically, a smaller sub-enclosure sits above the main woofer enclosure, with the two linked by a small port. This structure forms a Helmholtz resonator. The sub-enclosure and port dimensions are calculated to allow energy at the woofer’s resonant frequency to pass into the sub-enclosure where it is dissipated by damping material, thus smoothing the bass response. The woofer is crossed over at about 220Hz; above that, it’s all up to the DDD. That means that not only the power range of the orchestra but also the entire vocal range are reproduced without resorting to crossovers and tweeters. 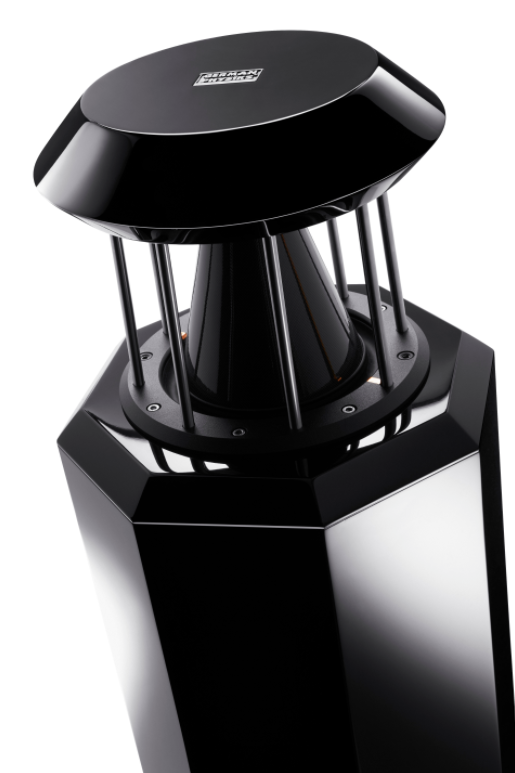 So why, you might wonder, aren’t omnidirectional speakers more popular? Conventional wisdom has it that such speakers lack image specificity. To be clear, the artifice of pinpoint imaging generated by directional box speakers has become the de facto paradigm in many high-end circles. The truth is that an omni can image very well indeed, not in the vein of tiny pixels on a wide sonic canvas but rather in a more realistic holographic fashion. I’ve never experienced pinpoint imaging during a live performance and certainly not in a concert hall. It’s an effect that can be achieved in multi-track studio recordings, especially when individual tracks in the mix are not drenched in artificial reverb. It would be fair to say that audiophile expectations and preferences regarding image specificity fall on a fairly broad continuum, and I totally get it, it’s just that my preference is for the sense of image scale and palpability that only an omni or planar speaker can deliver. The key with any omni speaker is to avoid early reflections that are within a 5-to-10ms time window of the direct sound. The worst thing you could possibly do, tantamount to sonic malpractice, would be to place an omni right up against a wall. The end result is likely to sound similar to the Bose 901 direct-reflecting loudspeaker. The 901’s motivation was to approximate the direct-to-reflected sound ratio measured in concert halls. This was done by using an array of drivers, most of which were aimed at the rear wall so as to splash reflected sound over the listening room and achieve a spacious but distinctly vague soundstage. The HRS-130’s owner’s manual offers guidance on speaker setup. The basic advice is to allow a minimum of one meter of breathing space to the rear and side of each speaker. That, however, may be a bit difficult to achieve in a small room, and argues for further controlling early reflections via acoustical treatment. Unless you prefer the extreme reflective acoustics of a racquetball court, you’ve already taken care to treat your listening space with absorptive elements such as carpeting, drapes, wall hangings, or a sofa. Specifically, what worked for me was to approximate a live-end dead-end (LEDE) environment by adding a couple of bass traps behind the listening seat, GIK acoustic panels (2' x 5') to the sides, and Audimute absorption blankets behind the speakers. The before-and-after impact of the acoustic treatment was quite dramatic. With the LEDE setup, image outlines could be localized within the confines of the soundstage with laser precision yet were spatially realistic in scale. For example, an upright bass should take up a fair amount of soundstage space, and that’s exactly how it was portrayed, with gobs of palpable extension. A welcome benefit of the LEDE acoustic treatment was a beefing up of tonal weight through the lower midrange and upper bass. This is the frequency band at which absorption material efficiency typically begins to fall off. Except for the inevitable room modes below 300Hz, frequency response was fairly uniform to 20kHz, with in-room bass extension to nearly 30Hz. If you’ve become accustomed to the anemic bass balance of a small stand-mounted speaker, you’ll be in for a big surprise with the HRS-130—welcome to big-tone country! The lower treble is adjustable in roughly 2dB steps (–2dB, flat, +2dB, +4dB) by moving a jumper wire on the speaker’s back panel. The treble EQ operates over the octave from 6 to 12kHz, with much of the effect being centered around 8kHz. I experimented with the –2dB and +2dB settings but always returned to the “flat” setting as being the most natural in my listening room.